Did you know that skin cancer is the most common form of cancer in the United States? Over a million new cases are diagnosed each year. In Birmingham, Alabama residents are exposed to considerably more ultraviolet radiation than people in most parts of the country, and this has resulted in a large number of individuals developing skin cancer or precancerous growths. A great way to do a basic at home skin check is to use the ABCDE criteria. The following criteria is found on skincancer.org. We are experts in the management of melanoma, including surgical removal and wound reconstruction. Most melanomas can be removed via a surgical excision. Basal cell carcinoma is the most common cancer in humans and is caused by lifelong sun-exposure, fair skin, and hereditary disposition. While rarely life-threatening, if untreated these tumors continue to grow larger and deeper, and can eventually invade into important structures such as nerves, blood vessels, and even bone. Squamous cell carcinoma is a common skin cancer. It arises from the squamous cells which form most of the top layer of the skin. 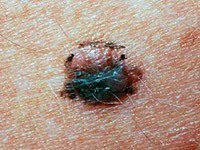 Like basal cell carcinoma, it is most commonly found in sun-exposed sites, but can arise in any location of the body. Squamous cell carcinoma has a low risk of spreading to other areas of the body, however certain cases have a slightly higher risk. The treatment is similar to the treatment of basal cell carcinoma. Most Squamous Cell Carcinomas may be removed via a surgical excision. How is the Surgical Excision of Skin Cancer Performed? Surgical excision is used to treat all types of skin cancer. It offers results that are both medically and cosmetically excellent. Technique: The physician begins by outlining the tumor with a marking pen. A “safety margin” of healthy-looking tissue will be included, because it is not possible to determine with the naked eye how far microscopic strands of tumor may have extended. The extended line of excision is drawn, so the skin may be sewn back together. The tissue sample will be sent to a lab, to see if any of the “safety margin” has been invaded by skin cancer. If this is the case, it is assumed that the cancer is still present, and additional surgery is required. The cure rates following excision are 95% and 92% for primary BCC and SCC, respectively, and are dependent on the site, size, and pattern of the tumor. Wounds heal rapidly. Scarring depends on many factors, including the placement of the tumor and the patient’s care of the wound after the procedure.